Each of us, sooner or later, is faced with the fact that the body changes its shape under the influence of natural processes. Do you want to be slim, despite physiology? It’s real! Most women try to keep track of their weight. But to lose weight in 37 years is much more difficult than in 17! It is equally difficult to keep the achieved result. Why is this so? Your calorie needs vary depending on whether you are growing, pregnant or breastfeeding, or maybe experiencing menopause. Take into account our advice, and it will be easier for you to lose weight in special periods of life. At 11-16 years old, the girl’s organism undergoes endocrine changes associated with growth. In a few weeks the figure of the girl is rounded: the teenager turns into a girl. All this happens at different ages, so an “early” girl can be frightened by the changes that occur with her body, and feel embarrassed by her differences from her peers. To eliminate the “shortcomings”, adolescents begin to limit themselves to eating. Statistics are inexorable: 25% of fifteen-year-old girls are on diets. At the same time, one third of them have normal or even insufficient weight! If the adolescent is not eating properly, the first blow from the lack of vitamins is taken up not by appearance but by the brain. As a consequence, the perception of information worsens, intellect suffers. Restrictions in nutrition are fraught with malfunction of the gastrointestinal tract, skin and hair problems. But the most unpleasant thing is that the girls can be disturbed by the development of menstrual function, which means that the possibility of becoming pregnant and bearing a child in the future can be questionable. During this period, the teenager is intensively growing, and he needs a protein. And most of it is desirable to receive from animal products, because they contain essential amino acids. The excess of proteins is also bad – the nervous system becomes more irritable. The most valuable fats for a growing organism are vegetable. Carbohydrates in the diet of adolescents – the main source of energy. Of carbohydrates, a girl should receive no more than 50% of all daily calories, while it is better to reduce the consumption of white flour and sugar. It is not worth to give up sugar at all – glucose is necessary for the brain. The girl especially needs calcium (for building bones), iron (lost during menstruation) and magnesium (for better brain function). Help your daughter lose weight! • Serve a lot of fruits and vegetables (fresh, frozen or home-preserved). • Do not buy sweet drinks, foods that contain a lot of fat and calories so as not to tempt a teenager. • Plan a healthy menu for the week. • A girl should have breakfast every morning. It improves the metabolism. • Walk and play sports together – why not improve your shape? The most effective means of dealing with teenage fullness is to change the habits of the whole family. • Avoid fast food. If you go to a fast food diner together, choose the most healthy food. • In order for your fat daughter to eat less of a bun in a school canteen, give her a full portion of healthy food, such as a large rye bread sandwich with vegetables and cheese. • When a variety of foods are constantly present on the table, in which there is little fat, sugar and a lot of fiber, children usually get used to such food. Healthy food will benefit the whole family. Take a walk and go in for sports together – why not improve your shape and shape? The best way to combat teenage fattening is to change family eating habits and spending leisure time. The normal weight gain during pregnancy is 9-12 kg. Try to keep the scale arrow off scale. Adding weight at this time is a sign that everything is going well. But even if the increase exceeds the norm, dieting should never be allowed! To begin with, consult a doctor and go through the necessary examination: perhaps excess weight is caused by fluid retention in tissues and organs. Pregnancy is not the time to lose weight, but it is not a reason to conduct food experiments. You should be as mobile as possible, fully nourished and gain strength. For diets and serious physical exertion there will be time – but only after you give birth to a child. A pregnant woman should not gain too much weight – this leads her at risk for complications of the second half of pregnancy (for example, late toxicosis, diabetes of pregnant women). In addition, due to overeating, the child can grow too large, and the birth will be difficult. Therefore, it is so important to carefully monitor your weight when you are carrying a baby under the heart. Pregnancy is a great time to figure out how, why and what you eat. The main rule: you must eat a variety. It is not necessary to eat “for two” – in the first trimester your calorie needs remain the same, and in the second and third grows by no less than 300 kcal. At the end of the pregnancy, you need at least 15% more than the usual daily energy requirement (for example, if you need 2000 calories a day, then at the end of pregnancy – at least 2300 calories). If you feel tired, irritable and lethargic, it is likely that you are not getting enough of the food. Eat natural products, try to move more and keep a good mood. And we will lose weight after delivery! • Look for healthy ways to snack throughout the day, such as eating whole-grain bread, apricots, yogurt, drink freshly squeezed juice. • Stay active! Do uncomplicated gymnastics, swim, walk more often. Avoid alcohol, preservatives, sugar, fats, refined products. It is generally believed that during breastfeeding, you need to eat tightly (so that there is milk), so a set of extra pounds is inevitable. In fact, this period – one of the most suitable for getting rid of excess weight, because with each liter of milk from the body takes about 50 grams of fat! During pregnancy, a normally eating woman is gaining more than her child weighs and his “supporting system” (growing uterus, placenta, etc.). Part of this weight is deposited in the fat layer, which increases during pregnancy, which provides the fetus with a normal temperature regime. About 500-800 calories the feeding mother spends on the production of milk (part of this energy is taken from food, part of the fat reserves created during pregnancy). Therefore, she can lose weight, while eating well. As you can see, breastfeeding is not only useful for your baby, it also helps you quickly return the former form. Breastfeeding women are contraindicated in rigid diets and restrictions, it needs to eat healthy food to provide themselves and the baby with all the necessary nutrients. You should eat at least 1500-1800 kcal per day. It is useful for many women to adhere to the upper limit of this norm. But in no case should not eat less than 1500 kcal – this is harmful to health and may not have the best effect on the quantity and quality of breast milk. Avoid unbalanced diets that promise a quick result. First, the effect from them is often short-lived, and secondly, they are usually poor in nutrients and vitamins, can contain an excessive amount of fat or protein. Liquid and low-carb diets, diet pills during breastfeeding are not recommended! You can afford to play sports: the choice of exercises and sets of activities is great enough. This includes walking at an intensive pace, swimming in the pool, and exercises on videocassettes designed for recovery after childbirth. Moderate physical activity is the best way to get rid of extra pounds, while not harming either the child or yourself. • Remember that even without resorting to special measures to dropping weight, you still are burning extra calories. So do not overdo it with restrictions. • Wait until the child is at least two months old. By this time the postpartum period will end, your body will adjust to the development of full-fledged mature milk, the quality of which will not be so dependent on calories consumed by you. • Studies suggest that breastfeeding for more than six months significantly accelerates the loss of “pregnant” kilograms. • Try not to lose more than three kilograms per month. This “allowance” will not affect the amount of milk and well-being of the child. • Reduce the amount of calories consumed gradually. Their sharp restriction the body can perceive as a “state of emergency” – and cut the tides of milk. Do the emphasis on physical activity. But do not overdo it: lifting the bar and running to the marathon distances is not the best load for the nursing mother. Every year after your forty, your metabolism slows down. In 46-52 years you will enter a period called menopause. Unfortunately, this means that if you do not make changes in your diet and do not increase the physical load, then over the next 10 years, you will gain about 10-12 kg! During the premenopause (40-46 years) in the body hormonal changes begin to occur. The period of 46-52 years is called climax or menopause (when the activity of the ovaries gradually fades). At this age, the woman accumulates weight “in reserve” – ​​about the same as it was in the adolescent period. If in 30 years you ate 1000 calories, then the body burned 700 of them, and accumulated 300. At 45, everything is exactly the opposite. The only thing that can speed up the metabolism is physical activity and exercise. In adolescence and youth, most of the excess weight settles on the hips, legs and arms. AT postmenopausal body fat is deposited on the middle part of the body, and you are sorry to notice that the size of the clothing has changed. This is due to the fact that with the extinction of the function of the ovaries in the body, male hormones begin to predominate and the redistribution of fatty deposits occurs according to the male type. The most extra calories burned by muscles – that’s why it’s so important to do sports! The increase in muscle mass by 2 kg accelerates the metabolism by 10%! To lose a kilogram per month, you need to reduce the daily diet by 270 kcal. It may seem that this is a lot, but in fact it is the equivalent of one large pack of crackers, a small plate of chocolate or a couple of sandwiches with butter. Before you implement a plan for weight loss, get a food diary and write down everything you eat, including small snacks, within a week. You will be surprised how much you eat superfluous, not realizing in it the report. It’s more difficult to lose weight during menopause. Be ready for this. It is known that a set of extra weight is associated with hormones. At this age, a condition such as insulin resistance – that is, insulin resistance to insulin cells, associated with changes in metabolism – can arise. This means that your body converts calories into fat, even when you are on a diet. Watch your food – and very soon the arrow of your scales will fix the victory! How to lose weight when the body experiences stress? The most important thing is to lead a maximally healthy lifestyle. And stop constantly weighing – to measure the volume, use clothes. Focus on your health, not on numbers! • Follow the meal plan – choose the right healthy system for you and stick to it as much as possible. • You definitely need proteins in every meal. 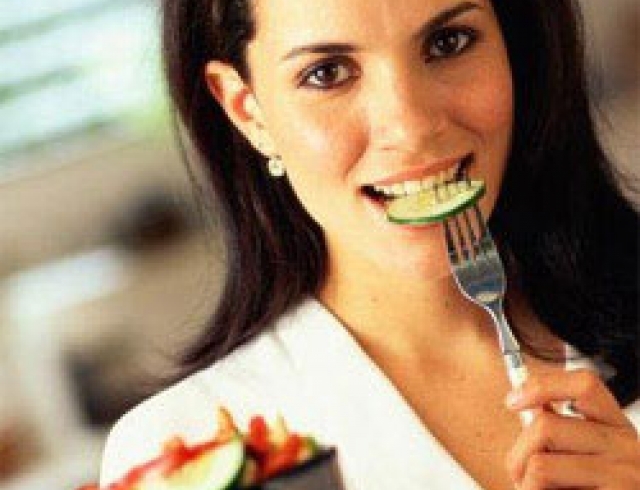 • You should get carbohydrates and fiber from fruits and vegetables, but you should eat the refined foods at a minimum. • Increase motor activity: walk 4-5 times a week for at least 30 minutes (this speeds up the metabolism), practice yoga, swimming. Try to minimize stress in your life, find time for rest and relaxation. • Drink plenty of water (at least eight glasses a day). • Get rid of the “seizing” of emotions: speak out, beat the pillow, but do not eat during stress. Menopause is a normal physiological process through which all pass. Take it easy.